Hair loss is not uncommon. It occurs in more than 50-60% of men and in approximately 10% of women. Balding is a major concern for many people, and surgery to treat hair loss (i.e. 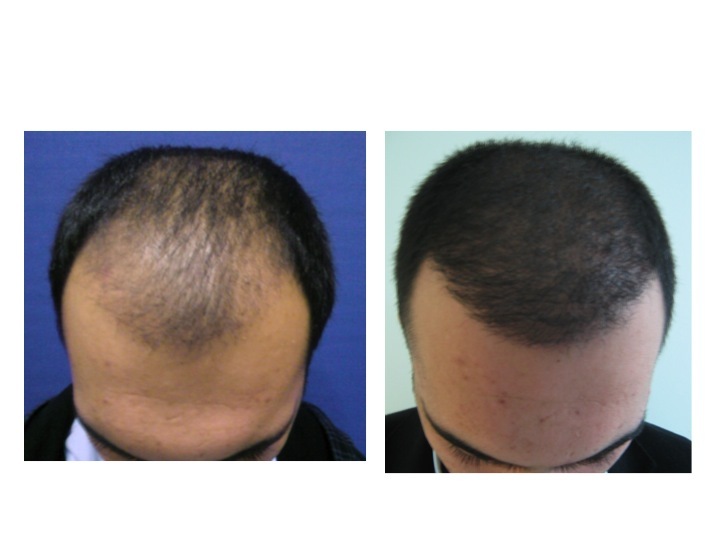 hair transplantation) is the most common cosmetic surgery procedure performed on men today. Normally a full head contains approximately 100,000 hairs. Even people with blonde hair have somewhat more than this. The loss of up to 30% of the number of your hair that you have in your post puberty period by middle age is part of the normal aging process. For thinning to become cosmetically noticeable, at least 50% of the hairs must have fallen out in a particular area. Loss of a smaller percentage than this generally does not result in the cosmetic appearance of hair loss. In addition to the loss of the number of hairs, the hair loss process causes individual hairs to thin, which further contributes to the appearance of hair loss. Is there system to classify the extent of hair loss? Yes there is. The Norwood Classification System categorizes the typical sequence of the hair loss process in men. Early in the process (types 1-3), the hairline recedes, typically led by frontotemporal recessions. In the latter stages (types 4-7), progression of hair loss at the vertex (crown) gradually meets and joins the progressive hairline recession, resulting in varying sizes (in both coronal and sagittal dimensions) of the confluent vertex with frontotemporal regions of baldness. Hair transplant or hair restoration is a hair replacement treatment for men and women. This procedure permanently restores hair by transferring new hair follicles into balding or thinning areas. Hair transplants correct male-pattern baldness and other forms of hair loss like eyebrow loss. Hair restoration surgery usually takes about 4-6 hours and is performed under local anesthesia and sedation. In this surgery, healthy hair follicles are removed from the back and/or sides of the head, and transplanted to areas where hair loss is occurring. The procedure usually involves transplanting follicular units -the natural bundling of hairs as they grow in the scalp, with each unit containing one to four hairs. There are two basic technique for hair transplantation. The first one is FUE and the second one is FUT. The most common technique is follicular unit extraction (FUE), in which each follicular unit is removed one at a time. In this technique one that avoids the linear scar from the donor site- back and side areas where hair follicles are removed. It can result in tiny dots on the back of the head that can hardly be visible if the head is shaved. The less common technique is “strip harvesting” which is sometimes referred to as follicular unit transfer, or FUT , which involves removing a single strip of the scalp where follicles are plentiful (the “donor site”) and then cutting out the follicular units to create grafts for transplanting. These follicular units are tiny little hair bearing cubic units. The average number of individual grafts needed depends on the patient; anywhere from 1,000 to 3,000 grafts is possible in an average day of surgery. Your recovery time will depend on the extent of the surgery. Most patients report mild pain, numbness and soreness; this can be controlled with pain medication prescribed by your surgeon. It is common for hairs from the transplanted follicles to fall out in the first month and then regrow. Within 4 to 5 months, they should be growing normally in their new location. Complications with hair transplant surgery are relatively uncommon. Potential hair restoration side effects may include scarring or uneven hair growth. If the results of the surgery are patchy or if the follicle grafts don’t establish well at the new site, your surgeon may wish to perform a follow-up surgery to correct scarring or to transplant more follicles to fill in thinner areas. Eyebrow transplantation is one of the most satisfactory cosmetic procedure in hair transplantation group. It is aesthetically challenging procedures to perform, but when done by experts, can provide an impressive and satisfactory result. This procedure can be done by FUE technique. One of the most important part of the procedure is carefully choosing the recipient sites for the hairs that will determine the direction and angulation of growth, as well as the aesthetic designing of what should be natural appearing eyebrows that complement the rest of the patient’s facial features. Absence of eyebrows of having this eyebrows is something that you can notice very quickly. When your eyebrows become thin or near total absent, the appearance of your face may affect your self-esteem and reduce your confidence. Due to developments in hair transplantation techniques over the past 10 years, eyebrow transplantation is possible and when performed properly, can provide beautiful results. Why Have An Eyebrow Transplantation? There are many methods of making eyebrows appear fuller. Tattoo or daily makeup application are some of them. But these have their drawbacks, one of which is that they are not natural solutions to your problem. As an eyebrow transplant takes the hair directly from your head, the hairs are permanent and can be done to appear as close as possible as to what the patient desires. Another advantage of the procedure is that it is virtually painless, and takes approximately 5 to 7 days from which to recover. This is true no matter whether the entire eyebrow or portions of the eyebrow are being restored. Regrowth rates of the transplanted hairs tend to be quite high, although the occasional patient chooses to have a second procedure to achieve greater density. How is the Eyebrow Transplatation Procedure? Depending on the extent of what you need , the procedure can involve the transplanting of anywhere from 50 to as many as 400 grafts per eyebrow, with each graft containing typically one or two hairs. The first step is the designing of the eyebrows. We do this in conjunction with your feedback but our doctor will assure that this designing is aesthetic and natural appearing. The donor hairs are typically removed from the back of the head, using the FUE technique. While the grafts are prepared under loupe magnification by our specialized eyebrow team, the team make all of the recipient sites, which will then determine the direction and angulation of growth. The grafts will then be placed one at a time into each tunnel of recipient site. The procedure is not completed until the very best eyebrows possible are created. Depending on how many hairs are transplanted, the procedure typically takes three hours. Patients can leave the Office with little discomfort of the donor area. Tiny crusts around each transplanted hair and some redness is to be expected for the first week. After that you might expect a lessening pinkness which can be concealed with makeup. The transplanted hairs will fall out at around two to three week, then these hairs should start to regrow at four months. During the second and third week, the eyebrows actually look quite nice, given that the hairs have not yet fallen out. Over the next six months, the eyebrows will typically get more and more dense. 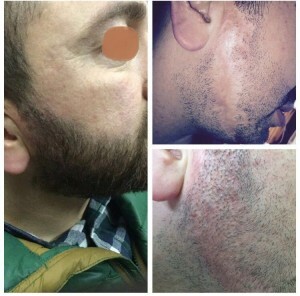 The technique we use for hair transplantation and eyebrow transplantation is also used for beard restoration.